A vehicle belonging to the Kurdish forces was targeted by an IS IED in the vicinity of Suluk. Some Kurdish casualties reported. 200 officials and dignitaries in Rmelan, northeastern Syria, are preparing to announce a Kurdish federal region in northern Syria. The announcement is expected to be made tomorrow as sides are smoothing out the final details. Tensions rise between local government-loyal NDF fighters and Asayish (Kurdish homeland security) forces in Qamishli. This morning 2 explosions were heard in an NDF-held square in the city. 60 NDF fighters were taken prisoner by the Asayish. JAN continue their hostilities against Division 13 forces as they arrest members of the faction and confiscate their weapons. Protesters in Ma’arat al-Nu’man continue protesting in the city against JAN and the Syrian government. Division 13 released a statement with the names of 18 Division 13 fighters including one commander which are still under JAN custody. Tishrin Dam: SDF vs IS. Reports of 3 SDF casualties in the past few days of fighting. Sheikh Maqsoud – Ashrafiyye Neighborhoods: Kurdish forces vs opposition and JAN forces. Reports of one Kurdish casualty and additional casualties on both sides. Northern Aleppo Governorate – Doudyan: IS vs opposition forces. Unconfirmed reports of IS retaking control over Doudyan. Markadah – Hasakah Governorate: SDF vs IS. Reports of casualties on both sides. Jabal al-Akrad – Jabal Turkman – Latakia Governorate: SAA and allies vs opposition, JAN, and Turkestan Islamic Party forces. Reports of one islamist opposition casualty. SAA soldiers in Deir ez-Zor outskirts. Image courtesy of @sayed_ridha. 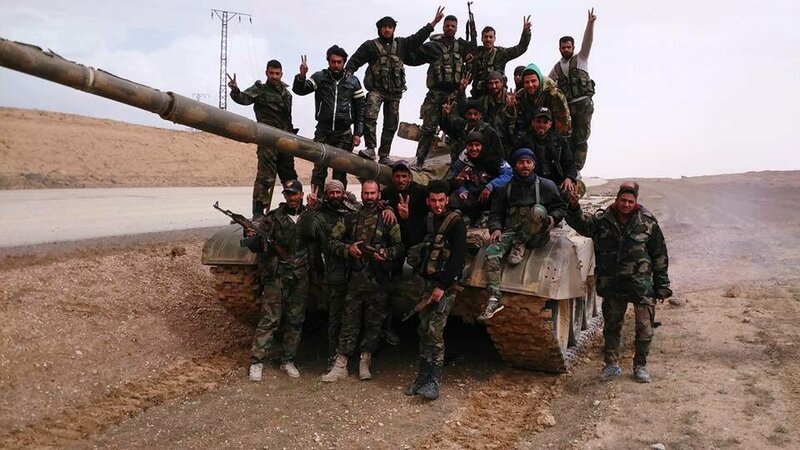 Palmyra – Homs Governorate: SAA vs IS. Reports of casualties on both sides. IS launch a counterattack against the SAA advances in the areas southwest of Palmyra. al-Hawiqah Neighborhood – Deir ez-Zor Governorate: SAA vs IS. Reports of one SAA casualty yesterday. Marj as-Sultan Vicinity – Damascus Governorate: SAA vs islamist opposition and JAN forces. Reports of one SAA casualty.